We think it takes 21 days to create a habit, but the University College London says it takes 66 days. Quite possibly ranging from 18-254 days. So we’ve got some work to do in creating a beautiful, healthy habit of sipping on life. 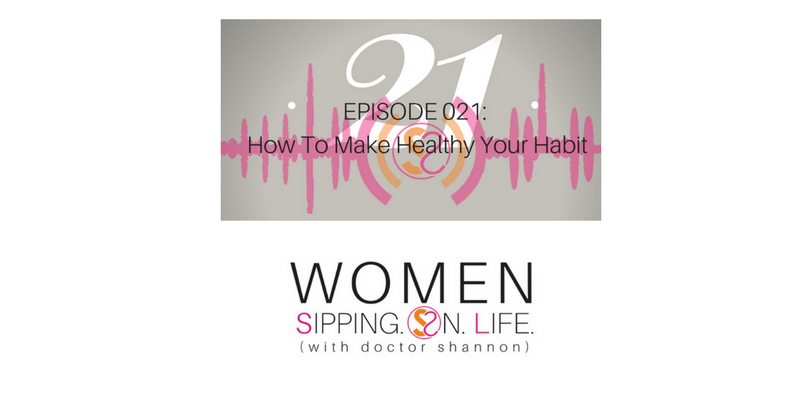 Back in 2004 I began writing my first published book called, Dr. Shannon Knows…The 12 Steps of WELLTHY People: How to Make Healthy Your Habit. I believe habits begin the moment we make a decision based on a mind/heart set. It’s a heart set decision. When you get your heart set on something, and you begin to practice it daily – like the habit of breathing – your life will transform the moment you make that decision. Change takes time, but transformation happens the moment we make a decision. A true habit begins the moment you get your heart set on it, and you make a decision to start. Each day you continue the process. You build on a foundation that creates health, WELLTH, and a life you love. Today’s SACRED S.O.L. STORY began back when, unbeknownst to me, I attended a Narcotics Anonymous meeting. The young woman on stage said her drug problem began when she was a little girl. Every time she had a sniffle, sneeze, cough, or felt uncomfortable, her parents gave her a drug. This started a pattern that led to a raging drug addiction by the time she was in college. The Narcotics Anonymous 12-Step Program helped her overcome her drug addiction. I was so intrigued by the program, and her story, that I wanted to learn more and attend another meeting. However, I was told that unless I had a drug or alcohol addiction, I couldn’t come back to their meetings. So my quest to discover such a program began. I searched for a 12-Step Program for healthy people to keep them that way, but couldn’t find one. You must be willing to get naked and unafraid. You must expose your heart and soul, the depth of who you are, the good, bad, ugly, the dark places within yourself that you’ve wanted to run from or push down, avoid, medicate, numb, or sedate. Awakening the truth within you is the first step. Often we have feelings, but when they’re uncomfortable we back away, run, or try to avoid them. Instead, we must press in and lean into how we feel. You’ve got to feel it to heal it. And you must be willing to speak the truth about how you feel. The key is getting really honest about it. You must be willing to “call it out.” Naked, unashamed, unafraid. Unafraid doesn’t mean that you’re without fear, but that you’re not afraid to talk about it. You can’t get to where you’re going without knowing where you are. Without being HONEST, it’s not possible to truly locate yourself. Expose yourself first. Tell the truth. Then see where you are. Often we know others better than we know ourselves. We neglect the time, energy, and attention that’s required for us to really get to know ourselves. How we feel, think, and what we desire matters. If you want to create the habit of being healthy, or anything great in your life, you must KNOW YOU. If you don’t know YOU, how will you know what you like and dislike? Often we don’t know ourselves well, because we’ve gotten in the habit of medicating, avoiding, and/or running from our feelings. Your feelings about you, and your life are one of the greatest avenues into KNOWING yourself. A lot of times we don’t take this road because it feels uncomfortable. BUT…on the other side of your discomfort is an incredible discovery. What do you believe, desire, and trust? Ask yourself if you’re trustworthy. If you don’t know yourself, how can you truly trust yourself? I believe trust issues start with the relationship we have with ourselves. If you’re not one of the people you trust, then how you can you trust others? You can’t trust someone you don’t know. You must become ONE of these people by knowing YOU first. Trust in yourself is such a vital component to living the life you love, living a healthy life, and creating the habit of being healthy. That way you can become addicted to your life and caring for YOU. This is a lifelong journey, and a habit that’ll last a lifetime. Make healthy your habit. Make WELLTHY your habit. Invest in your WELLTH. Your return on investment (ROI) is huge. Your health is one of the greatest assets you have. It’s asking for your attention, love, and care. 1. Grab your SACRED S.O.L. D.A.T.E. Journal (Daily Action To Engage with yourself). 2. Write down ONE goal for your health. 3. Take a step today. You’ll begin to create a habit that’ll last a lifetime. If you haven’t yet gotten your free copy of Date Yourself Well, come over to WomenSippingOnLife.com and request a copy (all you pay for is shipping.) I’d be happy to send you a FREE COPY today.